In November 2013, University of California President Janet Napolitano announced the Carbon Neutrality 2025 Initiative. This initiative commits UC to emitting zero net greenhouse gases from all of its campuses and vehicle fleets by 2025, something no other major university system has done. As the sustainability consultant to UC Riverside for its 2015-2025 physical master plan, Brightworks Sustainability conducted analysis, designed a strategy, and recommended implementation measures by which UC Riverside could achieve the UC carbon neutrality initiative. In 2014, the year to which emissions data in the Master Plan Study are benchmarked, UC Riverside emitted 108,924 metric tons of carbon dioxide equivalents (MtCO2e). Buildings are the single greatest contributor to these emissions: in 2014, UC Riverside’s approximately 6,900,000 square feet of facilities produced 70,021 metric tons of carbon dioxide equivalents (MtCO2e), or 64 percent of the total. 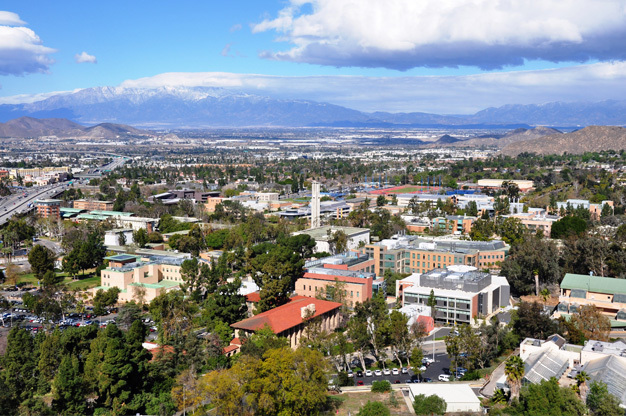 Sixty-eight percent of these emissions from UC Riverside buildings resulted from electricity generated to supply campus demand, while 32 percent resulted from natural gas combustion for campus needs. Under the Greenhouse Gas Protocol, these emissions fall under Scopes 1 and 2. The Master Plan Study targets existing and new buildings for measures that will mitigate campus carbon emissions because of the large influence of buildings on UC Riverside’s carbon footprint. The planning team then developed scenarios representing variations in these key factors to achieve carbon neutrality. Labelled Scenario 0, existing campus conditions (2014 for this Master Plan Study) provide a baseline benchmark for the five carbon neutrality scenarios developed by the planning team. The campus’s existing 6.4 million square feet of buildings have an average EUI of 130 kBtu/sf/yr. On-campus solar generation is limited to 3 MW from an existing ground-mount photovoltaic array, while on-campus solar hot water is limited to an existing system on the rooftop of a student housing facility. Scenario 1 demonstrates the effects of energy efficiency modernizations for existing buildings and aggressive EUI targets for new buildings – averaging 80 kBtu/sf/year across campus – at the full campus build-out of 8.9 million square feet. As this scenario reveals, energy efficiency alone cannot neutralize campus GHG emissions. After high-performance strategies are implemented for all existing and new buildings in a fully built-out campus of 8.9 million square feet, renewable energy must replace fossil fuels. If renewable energy cannot entirely replace fossil fuels, carbon offsets must be purchased to achieve carbon neutrality. Scenarios 1-5 demonstrate the effects of four alternative renewable energy scenarios for UC Riverside. Alternative B (Scenario 3) adds 9.7 MW of new rooftop solar energy production to the campus and solar hot water on the rooftops of all residential buildings. This scenario assumes 50% coverage (maximum practical) of all campus non-residential buildings with photovoltaic panels. In addition, this scenario reflects the addition of either 53 MW of off-campus solar energy production or 43 MW of off-campus wind energy production to UC Riverside’s energy supply. Alternative C (Scenario 4) adds 41 MW of new canopy solar energy production to the campus and solar hot water on the rooftops of all residential buildings. Solar canopies offer more area and thus more production capacity. By virtue of generating more energy on-campus from canopy solar arrays, this scenario reduces the capacity needed from off-site generation to 32 MW of off-campus solar or 23 MW of off-campus wind. Alternative D (Scenario 5) also adds 41 MW of new canopy solar energy production to current on-campus renewable energy generation and solar hot water on the rooftops of all residential buildings. In this scenario, campus infrastructure is also updated by decommissioning campus natural gas steam generation and introducing electric heat pumps instead. To offset this increased electrical load, off-campus renewable energy generation must increase to either 63 MW of off-campus solar energy production or 45 MW of off-campus wind energy production. UC Riverside’s carbon neutrality scenarios require campus building energy efficiency to improve from the current campus average EUI of 130 kBtu/sf-yr to a targeted averaged of 80 kBtu/sf-yr. Install solar thermal generation on all residential building rooftops. Install solar energy generation on all other building rooftops. Partner with utilities to develop off-site utility-scale solar and/or wind power to fulfill campus energy needs. After energy efficiency and renewable energy, any remaining carbon footprint will need to be addressed with carbon offsets. Carbon offsets can have limitations: they do not always result in additional greenhouse gas reductions (the concept of “additionality” is a fundamental and contentious issue with carbon offsets). Offsets should be seen as a last resort, as carbon offsets are annual payments with no payback and only include the benefit of carbon reduction, so grid generation is still required for the power. To reduce carbon emissions from existing buildings, UC Riverside should implement high-performance retrofits of existing buildings in order to meet recommended EUI targets. To reduce carbon emissions from future new buildings, UC Riverside should design to high-performance standards in order to meet recommended EUI targets. To reduce carbon emissions from electricity use, UC Riverside should install solar photovoltaic panels on all campus non-residential buildings and above parking lots, walkways, and other available open spaces. To reduce carbon emissions from natural gas use, UC Riverside should install solar hot water on all campus residential buildings. To eliminate all remaining on-campus fossil fuel combustion, UC Riverside should replace existing natural gas-powered infrastructure with electric heat pumps. To achieve carbon neutrality, UC Riverside should partner with Riverside Public Utilities or third-party renewable energy developers to install significant off-site solar photovoltaic or wind energy generation capacity to supply all remaining campus demand. Reduce existing building energy use by 49%. Achieve performance 36% better than California energy code for new buildings. Install 10 MW of solar photovoltaic capacity on all non-residential building rooftops. Install 16 Billion Btu/yr of solar hot water on all residential building rooftops. Install 8 MW of solar on 25 acres of campus open space and above parking lots and walkways. Install 53 MW of off-campus solar on 162 acres of land or 43 MW of off-campus wind on 3,690 acres of land. Purchase $175,000 per year of carbon offsets to account for natural gas combustion or convert all remaining natural gas infrastructure to electric and install additional 15 MW of solar or 12 MW of wind energy to account for this increased load. Fully quantify Scope 3 Emissions and purchase offsets for Scope 3 Emissions (resulting mostly from transportation and supply chain emissions).